Just to get a little something off my chest real quick: Why do people whine so dang much? Geez. It's called life and it's not supposed to always be easy. Next, for two takes in one, I overheard another mom say something that really helped me get through this week. She stated, "It takes a true educator to know the difference between 'unschooling' and not doing anything with your kids." That little statement (that wasn't even intended for me) helped me finish this hectic week that was too full of activities. Sometimes it is better to watch the movie for the read-a-long you just finished instead of making your kids finish yet another page of math. Homeschooled kids need down time too! Blanket warriors. They fight each other with... wait for it... blankets. The third warrior is not pictured because he was hurt when he was whipped in the eye with a doll quilt. My daughter continues to impress me with her amazing sense of fashion. We arrived at a field trip in Pittsburgh a little early and we able to check out an added bonus: replicas of two of the boats that Columbus sailed to America. We didn't tour the boats, but since we were the only ones there the tour guide was happy to answer our questions. Isaac took these photos of the awesome sunset from our back deck. I got a little behind on my blog and emails and so I tried to knock out all my duties for both of those in the short span between Wed night and Thursday morning. I had emails dated in August that still needed responses. I used to think email was a fun way to connect with people. Now I am reconsidering my position as it has become a real chore to keep up with it. People email the most ridiculous things, and expect an immediate intelligent response. I usually try to be kind and thoughtful in my responses, but some of the things are so petty that they really deserve a petty response. So if you received an email from me stating something like, "Who cares about this and you are a fat pig." then please disregard it as a low sugar moment for me when Malcolm was screaming bloody murder (again). And lose weight to avoid the fat pig response. Ha ha, I am not that mean...yet. But comments from "friends" this week have me rethinking the image I present to the rest of the world. Do I look like a superstar? Or worse, do I act like one? Because I do not carry a personal superstar image and any connection I may have to a superstar is completely coincidence. Except when I am with Heidi. Then we both shine like the stars that we are. 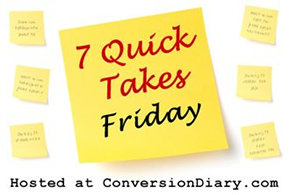 Head over to Conversion Diary to check out more Quick Takes. And say Congrats to Jen on Baby Number 6! That is so neat that you got to see those ship replicas. My kids would really like that.